First of all, let me say that I often have trouble just getting past the opening of this album… because I love it so very much. It’s a song called “Le Festin”, performed in French by Camille, and written by Michael Giacchino. It’s one of those lovely tunes that can make a hot room feel cool and a cold room feel warm. You know the sort of song… the kind that makes flat-footed klutzes like me feel like dancing, the kind of song that makes you want to rush out and kiss someone (my co-workers have grown increasingly uncomfortable around me over the past couple of months). To quotes oh-so-many comedians, “No, but seriously, folks…” it’s a really good song. 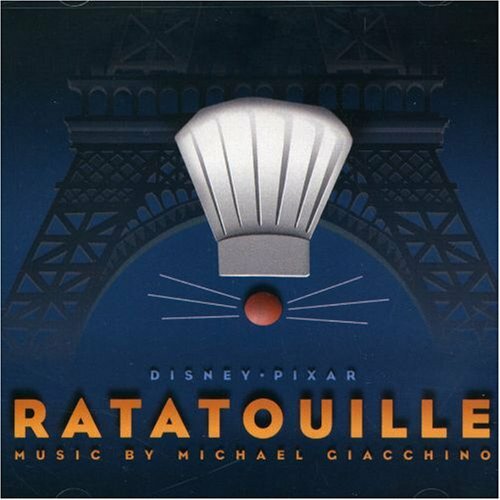 The tune is also the main theme of Michael Giacchino’s score for “Ratatouille”, which is wonderful, but rarely as wonderful as it is at the very beginning. In the second cue, we get brief tour of France… their national anthem, and then a pleasant accordion tune. That’s all they have, right? Hey, wait come back here… now I know that some of you have a bias against accordions. It’s okay, I used to, also. But after my recent anti-accordion rant at that public event, I took some time to learn more about accordion culture. In the right context… say, in this score… they can be downright delightful. Giacchino uses accordions quite well, making them a lovely part of the fabric instead of merely an obnoxious centerpiece. Giacchino has several themes that he uses throughout the score, all of them pretty good. A bit of lazy jazz runs through the pleasant “This is Me”, and shows up again on several occasions. There’s also plenty of mickey-mousing in pieces like “Granny Get Your Gun” and “100 Rat Dash”, but Giacchino does it all very well, often putting some catchy melodies at the center so we don’t get bored. Rolfe Kent’s increasingly influential “Sideways” score makes its influence heard in “Cast of Cooks”. Every piece is full of cheerful energy, and even goes so far as to include whistling and chipper harmonica solos in “Remy Drives a Linguini” (oh, Michael, you joker, you). I suspect the most popular theme will be the one that shows up first in “Colette Shows Him Le Ropes” (oh, Michael, you goof). It’s essentially a French twist on John Powell’s theme from “Mr. and Mrs. Smith”, but it’s different enough to have it’s own personality. As the score goes along, an increasing amount of orchestral sentiment creeps in, such as in the tender “Kiss & Vinegar” (Michael!). The whole affair closes with the “End Creditouilles”, which gives us a lengthy concert piece featuring spicy arrangements of all the primary themes. As a little bonus, there’s a tender version of the main theme that actually serves as the album’s closing cue. I know that not everything in the score feels 100% original. But darn it, I love this album. It’s unlikely that you’ll hear a more enthusiastic orchestral performance this year, or a film score that was so obviously crafted with love and joy, like a great meal. This represents precisely what goofy cartoon music sounds like at it’s very best, and I have a hard time picturing many people actually disliking this album. One of Giacchino’s best scores, arguably even better than “The Incredibles”, highly recommended. Music composed by Michael Giacchino. Conducted by Tim Simonec. Orchestrations by Tim Simonec, Jack Hayes and Larry Kenton. Recorded and mixed by Dan Wallin. Edited by Stephen M. Davis. Album produced by Michael Giacchino.